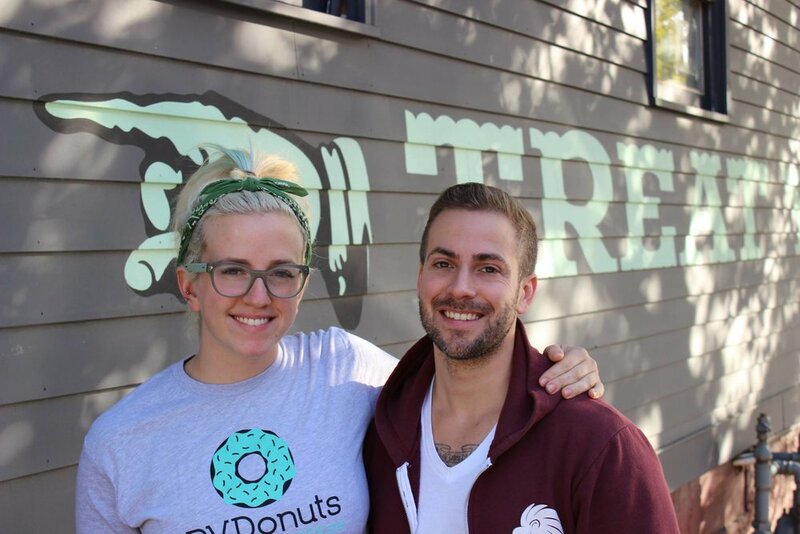 Learn more about the passionate and energetic team behind the PVDonuts adventure! We are proud to provide hand made donuts for you. Located in Providence, RI, we make hand-crafted SPECIALTY donuts. Truthfully, we didn't know what we were doing when we started, just that we wanted to bring something different and delicious to the food scene here in Rhode Island - a non-traditional take on a super traditional treat (donuts) that folks weren't used to. What started out as a discussion around a campfire with a few drinks turned into PVDonuts, and we honestly couldn't have imagined we'd be where we are today! Now our mission is to continuously provide people with new and exciting donuts through our ever-changing monthly menus, and to support the great state of Rhode Island that continues to support us. We love being involved with the community in every way possible! We work with a ton of locals ranging from other food business to various skilled artisans, and each month we give back in some way, shape, or form by contributing to a different cause. Lori and Paul Kettelle, Owners of PVDonuts - if you ever see us around town, make sure to say hi! I am the Co-Owner and Head Baker here at PVDonuts! When I started on this journey a couple of years back, I did a ton of R&D to find the right recipes, which I can't wait for you to try! When I'm not making donuts, I can most likely be found taking a nap (bakers hours, c'mon), at a nursery looking for new plants (more often than not, Brigg's in N. Attleboro), or reading crazy Game of Thrones fan theories (thoughts on Jon Snow? I'd be happy to debate). If I were a donut, I'd be a brown butter pecan PVDonut. I'm so thankful for everyone's support so far and I'm beyond excited for PVDonuts to open so I can finally meet everyone and be the first to start feeding the city of Providence some darn specialty donuts! When forced to describe myself (and I am being forced here) I'd say I'm somewhere between yoga and pizza. I've been baking "professionally" for 6 years - but as a child I would help my mom bake chocolate chip cookies, often. I would always be there to smell the vanilla extract--I endlessly asked to taste it and one day she caved - and it was awful. To say I'm excited to be a part of this adventure that is PVDonuts is an understatement. If I were a donut, I'd probably be a honey sea salt.